For the history of Scooby-Doo, check out this post here. After The New Scooby-Doo Movies, the Scooby franchise was allowed to languish in syndicated reruns for the next three years. When CBS decided not to renew the broadcast rights, former CBS executive Fred Silverman quickly snatched them up for his new home at ABC. The result was the third incarnation of the franchise called The Scooby-Doo Show once the series went into syndication in 1980. The show actually originally aired as part of three different programming blocks. 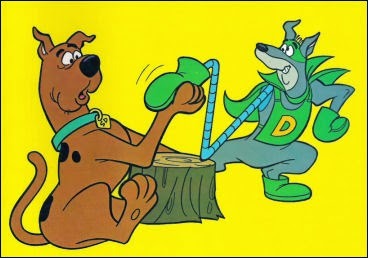 The first season debuted with a new canine superhero created by Hanna-Barbera called Dynomutt, Dog Wonder (Frank Welker) in an hour-long program called The Scooby-Doo/Dynomutt Hour. In 1977, a new two-hour programming block called Scooby’s All-Star Laff-A-Lympics premiered. It featured reruns of the 1969 show and the second season of Scooby, as well as the other Scooby-led show Laff-A-Lympics, new program Captain Caveman and the Teen Angels, and new episodes of Dynomutt titled The Blue Falcon & Dynomutt. 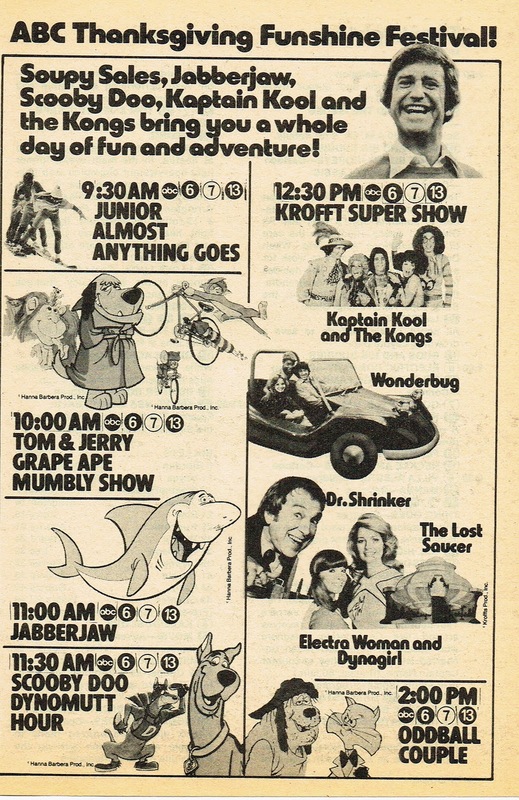 The block was renamed Scooby’s All-Stars in the 1978 season and shortened to an hour and a half after Dynomutt was spun off into its own show and the 1969 reruns were dropped. Reruns of the newer Scooby ran during the block while new episodes aired earlier as a continuation of Scooby-Doo, Where Are You!, complete with the original opening titles. 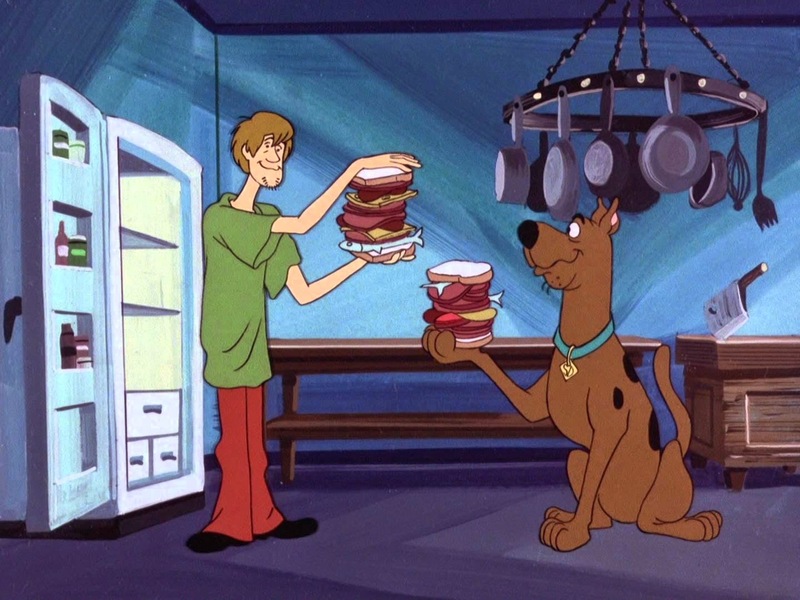 After the first nine episodes, the early episodes were cancelled and new episodes began airing within the block as a continuation of The Scooby-Doo Show. The series debuted the first new recurring character since the franchise’s creation, Scooby’s country cousin Scooby-Dum. Scooby-Dum (Daws Butler), as the name implied, was a bit of a dimwit who resembled Scooby-Doo with gray fur, red collar and matching red hat. Scooby-Dum was patterned after Edgar John Bergen’s puppet character Mortimer Snerd. A second cousin, female show-dog Scooby-Dee (Janet Waldo) also made an appearance in an episode. Despite being related, both Doo and Dum were in love with Dee. A new show on a new network? This calls for a sandwich! While the cast was largely retained from The New Scooby-Doo Movies, Pat Stevens replaced Nicole Jaffe as the voice of Velma due to Jaffe’s retirement from acting. 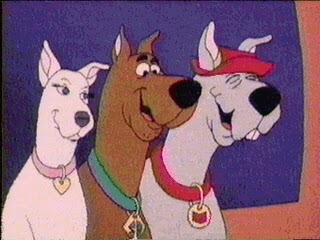 Scooby creators Joe Ruby and Ken Spears were retained by Silverman as production supervisors for the entire ABC Saturday morning line-up, as they were under him at CBS. As a result, they were directly involved with the production of the first two seasons. However, by the time the third season was being worked on, ABC had set them up with their own studio as a subsidiary of Filmways Television, and Ruby-Spears Productions was born. Ad for the 1976 Thanksgiving Funshine Festival on ABC. Only the first and second seasons had been released in their entirety on The Scooby-Doo/Dynomutt Hour: the Complete Series and Scooby-Doo, Where Are You! The CompleteThird Season respectively. While several episodes of the second season had been released on various DVD collections, the entire season had yet to be released in its entirety outside of digital streaming services. The episode “There’s A Demon Shark in the Foggy Dark” was originally broadcast Thanksgiving Day in 1976 as part of ABC’s Thanksgiving Funshine Festival. Three of the four final episodes of the series were never shown as part of the syndication package and, after their initial broadcasts, wouldn’t be seen again until the series began to run on cable stations. “High Rise Hair Raiser” (9/11/76) – Fred, Shaggy and Scooby encounter the ghost of the man who lived in the house that stood on the construction site where they work. “The Fiesta Host Is An Aztec Ghost” (9/18/76) – The ghost of Katazuma and his Aztec statue henchmen cause the fiesta in Cinqo, Mexico to be cancelled. “The Gruesome Game of the Gator Ghoul” (9/25/76) – The gang encounters the Gator Ghoul of the swamp while visiting Ma & Pa Skillet and Scooby-Dum. “Watt A Shocking Ghost” (10/2/76) – A 10,000-Volt Ghost inhabits the town where the gang is forced to spend the night. “The Headless Horseman of Halloween” (10/9/76) – The gang takes Scooby-Dum to a Halloween party where a Headless Horseman abducts one of the guests. “Scared a Lot In Camelot” (10/16/76) – Shaggy’s uncle goes missing and the culprits are the ghosts of Merlin and his Black Knight. “The Harum Scarum Sanitarium” (10/23/76) – The gang heads to Niagara Falls where they stay in an asylum being haunted by the ghost of Dr. Coffin. “The No-Faced Zombie Chase Case” (10/30/76) – The gang follows a faceless zombie that stole a rare coin and end up being chased by him and a gorilla. “Mamba Wamba and the Voodoo Hoodoo” (11/6/76) – The gang sees their friend Alex’s band, but when they play a song based on a voodoo chant they summon a ghost. “A Frightened Hound Meets Demons Underground” (11/13/76) – The gang investigates an underground ancient city inhabited by demons in Seattle. “A Bum Steer For Scooby” (11/20/76) – Visiting Daphne’s uncle Matt leads the gang to encountering a flying bull that causes cattle to disappear from his ranch. “There’s A Demon Shark in the Foggy Dark” (11/25/76) – The Maharaja’s jewels are stolen at the airport, but the only suspect is a demon shark encased in a block of ice. “Scooby-Doo Where’s the Crew?” (11/27/76) – The gang helps a professor research a sunken ship where the ghostly crew returns to chase them off. “The Ghost That Sacked the Quarterback” (12/4/76) – The star quarterback disappears from a game and is replaced by a ghostly vengeful football player. “The Ghost of the Bad Humor Man” (12/11/76) – The Mystery Machine crashes in front of an ice cream factory haunted by phantoms. “The Spirits of 76” (12/18/76) – The gang gets locked in the Smithsonian Institution where they find Benedict Arnold, William Demont and John Andre haunting the place. “The Curse of Viking Lake” (9/10/77) – Velma’s uncle John is missing, but Viking ghosts are found. “Vampire Bats and Scaredy Cats” (9/17/77) – Lisa Banoh inherits the hotel on Great Skull Island and discovers she’s descended from a long line of vampires. “Hang in There Scooby-Doo” (9/24/77) – The ghost of a pterodactyl scares people off from a hang gliding contest. “The Creepy Heap From the Deep” (10/1/77) – A beach party is crashed by a monster who feeds on souls to stay alive. “The Chiller Diller Movie Thriller” (10/8/77) – The gang has to protect Scooby-Dee from the ghost of Milo Booth whose movie she’s currently remaking. “The Spooky Case of the Grand Prix Race” (10/15/77) – Shaggy must race a Phantom Racer to find out what happened to the other racers when they entered a fog. “The Ozark Witch Switch” (10/22/77) – The feud between the Hatfields and McCoys continues when the ghost of Old Witch McCoy comes back for revenge. “Creepy Cruise” (10/29/77) – On a cruise, a professor tests his time machine bringing a futurist monster back that steals the professor’s money. “The Creepy Creature of Vulture’s Claw” (11/11/78) – The gang visits Professor Greer and decide to help solve the mystery of a creature roaming around his place. “The Diabolical Disc Demon” (11/18/78) – The gang’s friend Jimmy Lewis’ recording session is haunted by the ghost of a former singer who wants a half-finished song by a missing writer. “Scooby’s Chinese Fortune Kooky Caper” (11/25/78) – The gang’s new friend Kim stands to inherit a fortune and a Moon Monster, whose shadow can turn someone to stone. “A Menace In Venice” (12/2/78) – The gang’s friend Antonio gives Daphne a necklace similar to his, and the Ghostly Gondolier kidnaps them both to get them. “Don’t Go Near the Fortress of Fear” (12/9/79) – The ghost of General Juan Carlos chases the gang away from his fortress in Puerto Rico. “The Warlock of Wimbledon” (12/16/79) – Anthos the Warlock demands the gang’s friend Jimmy Pelton forfeit the Wimbledon tournament. “The Beast is Awake in Bottomless Lake” (12/23/78) – The gang investigates the bottom of the lake to discover the origins for the creature that lives there and scares everyone off.